Artificial vertebral disc replacement is emerging as an attractive alternative to anterior cervical discectomy and fusion for cervical degenerative disc disease. Artificial vertebral disc replacement is emerging as an attractive alternative to ACDF. The principal benefit of total disc replacement (TDR) from the patient’s perspective is that it preserves freedom of motion in the cervical spine. These findings mirror my clinical experiences with cervical disc replacement. While the cervical disc replacement surgery takes a bit longer and is more technically challenging than ACDF, patient outcomes are undoubtedly better. My TDR patients tend to recover more quickly after surgery, have substantially better range of motion, and better long term outcomes than myACDF patients. Multiple lines of clinical research now support the assertion that TDR provides clinically superior outcomes to ACDF. Nonetheless, I find that many spine surgeons are reluctant to offer TDR for cervical disc disease, opting for the more traditional ACDF procedure. This is especially true in two-level disease. The major reason for this reluctance, I believe, is the relative novelty of TDR in cervical disc disease. Artificial discs have only been approved for use in the cervical spine in the United States since 2007. Their history in cervical disc disease is even shorter, and their history as a two-level treatment in multilevel cervical disease is shorter still. This reluctance to move toward TDR may soften as clinical trial data with longer endpoints are published. Since 2015, a series of reports have documented excellent intermediate and long-term outcomes of TDR vs ACDF in cervical disc disease. The results from replacement at two adjacent levels are particularly compelling. The first device approved in the US to treat multilevel cervical disease was the Mobi-C™ (LDR Holding Corporation, Austin, Texas). I was one of the investigators who participated in the investigational device exemption (IDE) trials. Investigators followed 225 surgical candidates with degenerative cervical disc disease treated with the Mobi-C™ TDR device and compared them to 105 similar patients treated with ACDF.8 At two years, all patients experienced substantial benefits from surgery including reduced pain and disability. However, participants treated with TDR had substantially better range of motion and better pain scores than those treated with ACDF. I also participated in a clinical trial as the Principal Investigator comparing the Prestige LP™ (Medtronic Inc, Elizabeth, New Jersey) TDR device with ACDF in 2-level cervical disease. The work was performed at 30 surgical centers in the United States on 397 spine surgery candidates with multilevel cervical disc disease who were candidates for spine surgery. Participants were randomized to the Prestige LP™ (n=209) or ACDF groups (n=188). The primary endpoint was “overall success,” which was a composite variable of several safety and efficacy endpoints. For the surgery to be an overall success, patients needed to have substantial increases in measures of pain and disability without any serious adverse events or surgical failures. I presented these long-term (7-year) outcomes at the 84th American Association of Neurological Surgeons meeting in Chicago. A full publication is in press. Briefly, we found the PCS component of the Short Form-36 was significantly better in the Prestige LP™ group than the fusion group at 60 months. At 84 months, TDR with the Prestige LP™ device was statistically superior to ACDF in the overall success variable, Neck Disability Index, and neurological success. Patients in the TDR group had significantly fewer serious adverse events related to the implant and/or the surgical procedure. Perhaps most interestingly, patients in the TDR group underwent fewer secondary surgical procedures than patients in the ACDF group did. Specifically, 4.2% of patients in the TDR group required a second procedure on the cervical spine compared to 14.7% in the ACDF-tread group. There were fewer surgeries in adjacent vertebral levels than in ACDF patients (6.5% and 12.5% for TDR and ACDF groups, respectively), but this result did not quite reach statistical significance (P =.058). The last 18 months has seen a flurry of positive outcomes data for TDR in the treatment of degenerative cervical disc disease. Data up to 7 years post-operative show not only non-inferiority, but superiority in safety, efficacy, range of motion, and long term outcomes over ACDF. The last remaining question is whether TDR reduces the rate of adjacent disc surgeries compared to ACDF. We intend to follow the Prestige LP™ 2-level cohort for up to 10 years. Given the clear trend of the 7-year data, my strong suspicion is that TDR will be statistically superior to ACDF on all tested outcomes, including adjacent disc surgeries. Perhaps this will be enough for spine surgeons to finally acknowledge the primary role of total cervical disc replacement as an alternative to ACDF. A Diplomate of the American Board of Neurological Surgery and a Fellow of the American College of Surgeons, Dr Lanman leads his spinal neurosurgery practice, Lanman Spinal Neurosurgery in the heart of Beverly Hills, which is affiliated with Cedars-Sinai Medical Center, UCLA Medical Center and Saint John’s Medical Center. Dr Lanman earned his MD at Chicago’s Northwestern University in 1983 with top honors and went on to complete his residency in Neurological Surgery at University of California at Los Angeles, under the aegis of Doctors W. Eugene Stern and Donald Becker in 1989. Since then, Dr Lanman has led his spinal neurosurgery practice in the heart of Beverly Hills, which is affiliated with Cedars-Sinai Medical Center, UCLA Medical Center and Saint John’s Medical Center. As a leading innovator in medicine, as well as a media educator and contributor, Dr Lanman has published more than 10 peer-reviewed articles, as well as book chapters on topics relating to neurological surgery, and has presented more than two dozen papers at national and regional medical society meetings. His expertise is often sought out as he is often tapped to be the principal medical investigator on a wide swath of clinical trials for motion preserving surgeries and artificial disc replacement devices, most recently the Prestige LP and M6, with the former recently receiving FDA pre-market approval on July 6, 2016, through his continuous support. He has also remained an assistant clinical professor at UCLA for the past 20 years. Yue WM, Brodner W, Highland TR. Long-term results after anterior cervical discectomy and fusion with allograft and plating: a 5- to 11-year radiologic and clinical follow-up study. Spine (Phila Pa 1976). Oct 1 2005;30(19):2138-2144. Hilibrand AS, Carlson GD, Palumbo MA, et al. 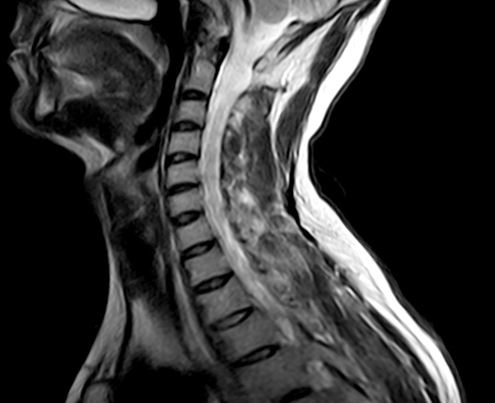 Radiculopathy and myelopathy at segments adjacent to the site of a previous anterior cervical arthrodesis. J Bone Joint Surg Am. Apr 1999;81(4):519-528. Davis RJ, Kim KD, Hisey MS, et al. Cervical total disc replacement with the Mobi-C cervical artificial disc compared with anterior discectomy and fusion for treatment of 2-level symptomatic degenerative disc disease: a prospective, randomized, controlled multicenter clinical trial: clinical article. J Neurosurg Spine. Nov 2013;19(5):532-545. Davis RJ, Nunley PD, Kim KD, et al. Two-level total disc replacement with Mobi-C cervical artificial disc versus anterior discectomy and fusion: a prospective, randomized, controlled multicenter clinical trial with 4-year follow-up results. J Neurosurg Spine. Jan 2015;22(1):15-25.